1. Czeizel AE & Dudas I. NEJM 1992; 327: 1832-5. 2. Nutrient Reference Values for Australia & New Zealand. Ministry of Health. 2006. Elevit with Iodine tablets are a pharmacy only medicine and contain vitamin B, C, D, E and minerals. Menevit contains antioxidants lycopene, selenium and zinc plus garlic and vitamins. Consult your healthcare professional to see if Elevit with Iodine is right for you. 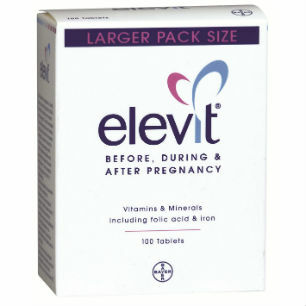 The New Zealand formulation of Elevit with Iodine is the same as that used in the Czeizel study except it contains Iodine and does not contain Vitamin A. There are a number of reasons for infertility and couples should discuss these with their GP or specialist. Medicines have benefits & some may have risks. Always read the label and use only as directed. If symptoms persist or you have side effects, consult your healthcare professional. Supplementary to and not a replacement for a balanced diet. Registered Trademark. Bayer New Zealand Ltd, Auckland. TAPS NA4727.